Browse Skins :: FavMee - Make my Homepage Smart & Stylish..!! Please Select a Wallpaper Category lisited above. 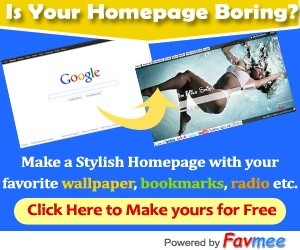 With FavMee, you can easily customize the Bookmarks and can easily make the bookmarks public or private. Top 25 Public bookmarks can be viewed on your personal homepage. You can also add thousands of widgets, including news, sports, e-mail, local events, search, photos, music, videos - even interactive tools like a calendar and a to-do list - and just about anything else you do on the Web at school, work and at home. © 2011 FavMee.com :: Make my Homepage! !